We’re here to help you choose, design and install the perfect floors — whether you’re a home owner, business owner, or have a completely new construction or renovation project, we are here to help you throughout the process. Add warmth and elegance to your home with beautiful wood floors throughout your home. We can help you choose the right wood flooring – whether it’s oak, pine, cedar, maple, hickory, walnut or an exotic hardwood – and can install on top of any type of sub-floor using floating, nail-down or glue-down installation techniques. The best of all worlds, our hardwood, stone and tile laminates offer the beauty of the natural materials with easy installation and simple maintenance requirements. 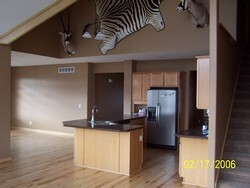 Laminates can be used in just about any space except areas that may be very wet. 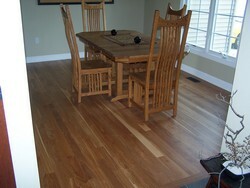 Ask us about laminate options for your needs! In addition to designing and installing all types of hardwood floors, we’re also experts at resurfacing, staining, recoating and refinishing. Return luster and shine to your old hardwood floor with McDowell’s Hardwood Floor’s resurfacing and restoration services. It may look impossible, but their is not a floor we can't bring back to life, no matter how old or damaged. Refinishing is an extensive service and starts with sanding the floors to remove the finish and a very thin layer of wood. We then rebuild the surface of the floor by staining, finishing and polishing. Refinishing enables us to remove deep scratches, grooves, stains and other signs of heavy wear. Resurfacing is used when there’s not as much damage to the floors; we buff the current finish, apply new finish and polish to a glow. If your wood floors have been covered with carpet, this is often all that’s necessary. McDowell’s Hardwood Floors, (517) 719-0248, fax: (517) 709-3339, info@mcdowellshardwoodfloors.com | Base Content Copyright © 2019 Market Hardware, Inc.